My 5-1/2yr old son is a huge fan of Power Rangers. He enjoys playing with all his figures and vehicles, but still I questioned if he was ready for the television series which is not animated. 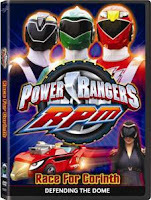 The Power Rangers RPM Volume 2: Race for Corinth DVD was a good test. I could gauge my son's interest in watching live action television. 1) I thought that the violence was minimal because the fighting is very stylized and the point of contact is rarely ever shown. 2) Since this DVD is one continuous story that is made to be broken up into episodes, I did not think that the story flowed very well. I also thought that having the story go back and forth between the present and the past may have confused my son a little bit. 3) I like that this DVD is geared towards girls as well. Part of the storyline reveals how the Yellow Ranger came to be and it really promotes "girl power". 1) He seemed to prefer when the Power Rangers were in uniform rather than in plain clothes. 2) My son though Dr. K's job was the coolest because she is able to tell the Power Rangers what to do. 3) His favorite scene from the movie was at the park where the Power Rangers fought to save an infant. 4) He described this DVD to be "fun", "cool", and "awesome". As of September 8th, 2009, you should be able to find this DVD online or locally at the Disney Store or at other major retailers of children's DVDs.